A selection of goodies from L.A. Burdick Handmade Chocolates in New York. If Valentine’s Day is about love, here goes: I love chocolate. So my Valentine’s Day offering is a list of underground chocolate shops, tiny places in remote areas of New York with nice people who dish out heaven. This exploration of secret chocolate shops was the most difficult task I have ever undertaken. I want to say I felt like a handcuffed kid in a candy store, but that would be too literal, while frustrated sexual metaphors would be too graphic. When I stepped into Kee’s Chocolates, down in the West Village, and saw a chocolate truffle with crème brulée, I wondered about the imagination that inspired such things. Kee Ling Tong is the product of a Macau family, so perhaps a Portuguese influence was here. “And,” says Honduran-born sales representative Kiko, “it isn’t as bitter as the original.” He should know. He also knows about their ganache chocolates, those creamy chocolates made with a whole host of flavours. Jacques Torres Chocolates caters to more successful artists, for this is not cheap. But Torres, originally a pastry chef from Paris, knows his chocolates. Everything—from the raspberries to the cream to the hot chocolate with the best chocolate, and handmade bonbons—“is the redefinition of decadence,” a friend told me. A London friend who, as a major backer for shows like Cats, can afford and certainly knows his chocolates, says he and his friends swear by Myzel Chocolate behind Carnegie Hall. “It’s a mom-and-daughter shop,” he says. “For years, they’ve been making their own chocolate by hand. They dip the chocolates themselves. Their chocolate-covered pretzels have an ambrosial mixture of salt and sweet. I wandered south again, to the Flatiron Building area, to see Paula Burdick, whose husband, Larry, is a professional chocolatier of long standing. Their little shop, L.A. Burdick Handmade Chocolates, is filled with goodies, but the real work is done in New Hampshire. 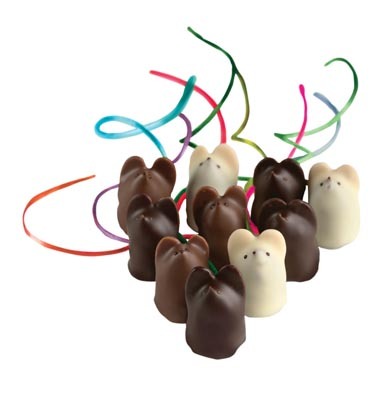 I told a friend he should try their “chocolate mice.” He laughed at my ignorance, correcting it to chocolate mousse. But no, Paula and Larry have chocolate mice—dark (with orange juice), milk (with espresso) and white (with cinnamon). The mice have almond ears and colourful, silky tales. They have chocolate penguins, rabbits and bees as well. And frankly, if you haven’t tasted their Chartreuse chocolate or dark chocolate or raspberry chocolate, you haven’t tasted great chocolate. “But we have two secrets,” said Paula. “Your Canadian readers can get almost all our chocolates up there. Except for our chocolate pavé, which we can’t possibly ship. Much too delicate. Ground hazelnuts, saffron, covered with chocolate, powdered cocoa. We all know that feeling, but “liking” is not the same as experiencing heaven in a single bite. Chocolate mouses—not mousses—from L.A. Burdick Handmade Chocolates. Be the first to comment on "Chocolate shops in New York: The unbearable sweetness of being a chocolate connoisseur"